On September 19th, a deadly 7.1 magnitude earthquake shook Mexico City, killing hundreds. Those who survived still live with the trauma. 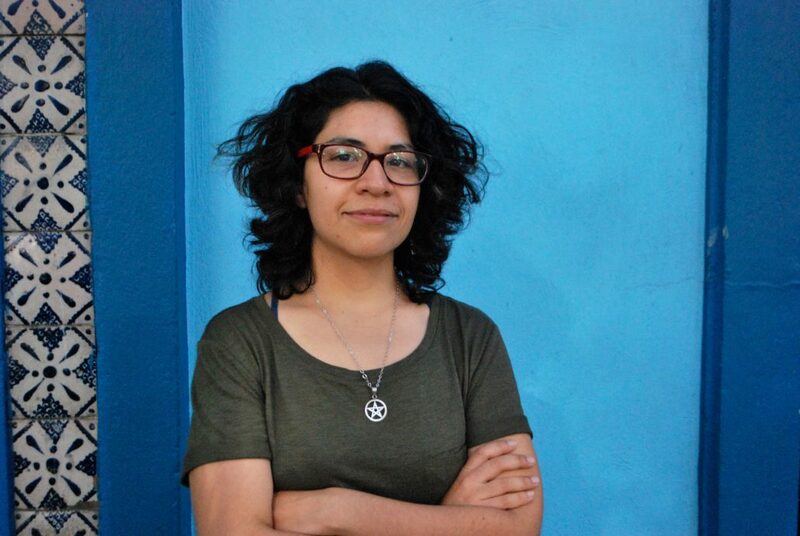 “I remember everything around cracked,” says Mich Mariaud, 29-year-old language instructor and Mexico City native. On September 19, 2017, a 7.1 magnitude earthquake shook Mexico City to its core, damaging thousands of buildings and resulting in 228 deaths. With eerie coincidence, this earthquake occurred on the 32nd anniversary of the 1985 Mexico City earthquake that killed upwards of 10,000 people. 32 years ago, the damage was so severe that concrete figures on those who died still aren’t known. Mich Mariaud has experienced symptoms of PTSD ever since the deadly September 19th earthquake in Mexico Citry. Mich is one of the millions of Mexico City residents suffering from post-traumatic stress following the earthquake. PTSD can manifest itself in people who have experienced a shocking or dangerous event. The disorder can result in disturbing thoughts, night terrors, event, personality change, and an increase in the fight-or-flight response, causing those who suffer from PTSD to sometimes find themselves living in a perpetual state of anxiety and terror. Natural disasters, such as the earthquake in Mexico City, often cause PTSD for the people that experience them. “These types of experiences are particularly insidious because they tend to traumatize large populations of people at once, and can result in epidemics of Survivor Guilt and other PTSD symptoms,” according to Psychology Today. A survey from the John Hopkins Bloomberg School of Public Health shows that after the 1985 earthquake in Mexico City, there was a 32% prevalence of PTSD within 10 weeks after the earthquake. 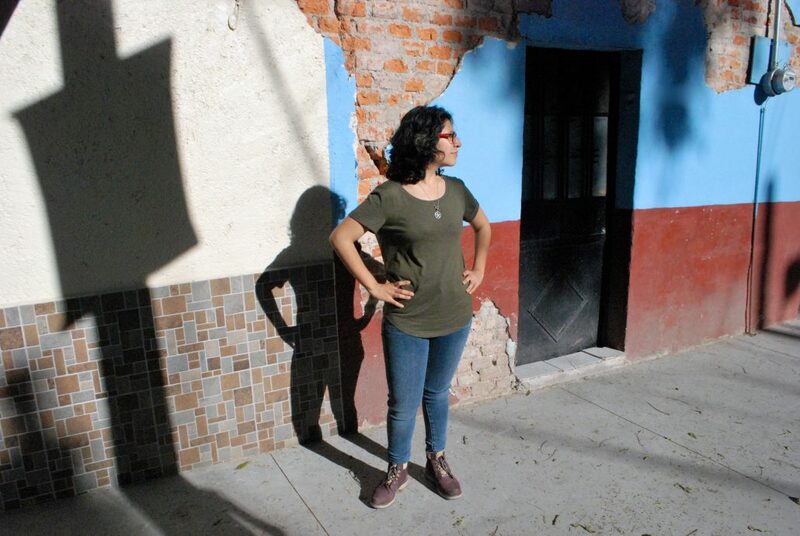 Mich remembers that less than an hour before the earthquake she was in a student’s 8th-floor apartment in the Condesa neighborhood of Mexico City. Later, this student told her that the apartment shook so violently that many things inside violently fell and smashed. After hearing this, even months later, Mich had a hard time bringing herself to take the elevator to her student’s 8th-floor apartment in the heart of Mexico City, “even though I knew her apartment was fine, thinking about going up to the 8th-floor made me panic,” she remembers. This is an example of an “avoidance symptom”, a common trait of PTSD, whether it’s acute or chronic. 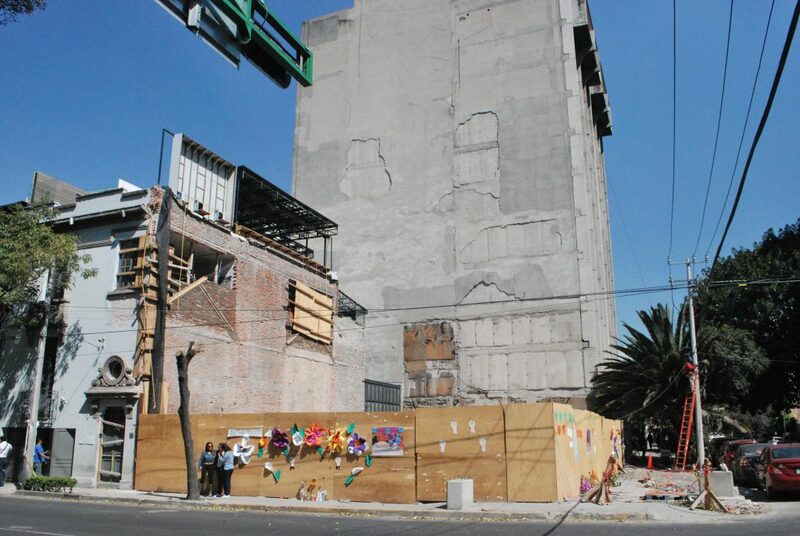 Months after the earthquake, destruction is still visible everywhere in Roma Norte. This building fell with victims inside. The quake struck at 1:14 p.m., merely two hours after a practice alarm sounded. This alarm goes off every year on September 19th to remind residents of evacuation procedures put in place after the 1985 earthquake that killed about 10,000 people. Ironically, for the actual quake, the alarm didn’t sound. But with the violent movement, millions of residents took to the streets in panic. Some ran from falling buildings covered in dust, others held onto each other while the ground shook beneath them. Mich was taking her lunch break in Roma Norte, one of the neighborhoods that was hit the hardest. After barely staying on her feet, Mich ran to find her mother to on Avenida Reforma. Reforma, a major thoroughfare that runs diagonally across the heart of the city, was full of people. “The worst part was the smell of gas,” Mich remembers. The smell filled the street and caused panic, pockets of people began to run through the street yelling about gas leaks. 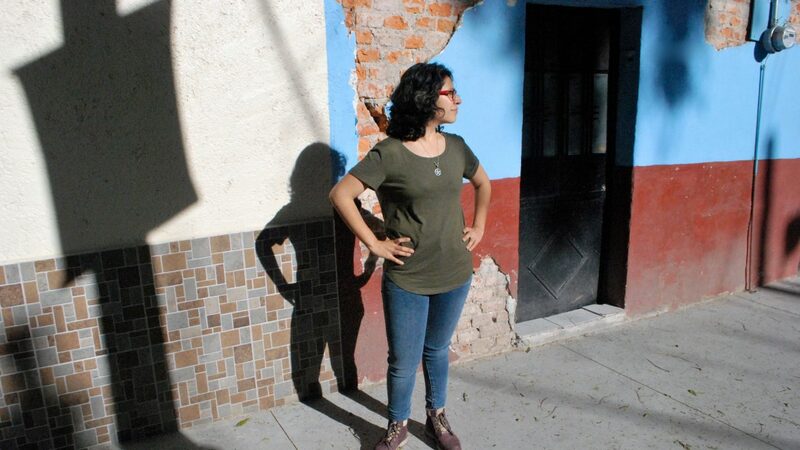 When she found her mom, they returned to their home in Ecatepec, about 16 miles away from the most affected areas. On the way home, seeing terrifying destruction along the way, they were terrified that their neighborhood may have also suffered intense damage. Had their home fallen? Were their neighbors safe? Luckily, the cracks in their building were superficial. The next day, Mich did not want to leave her home. She sat watching the news, too afraid to go back into the city. She, as did many other people, listened to the radio where officials asked residents not to get in the way of professional rescuers trying to save people possibly alive under the rubble of collapsed buildings. 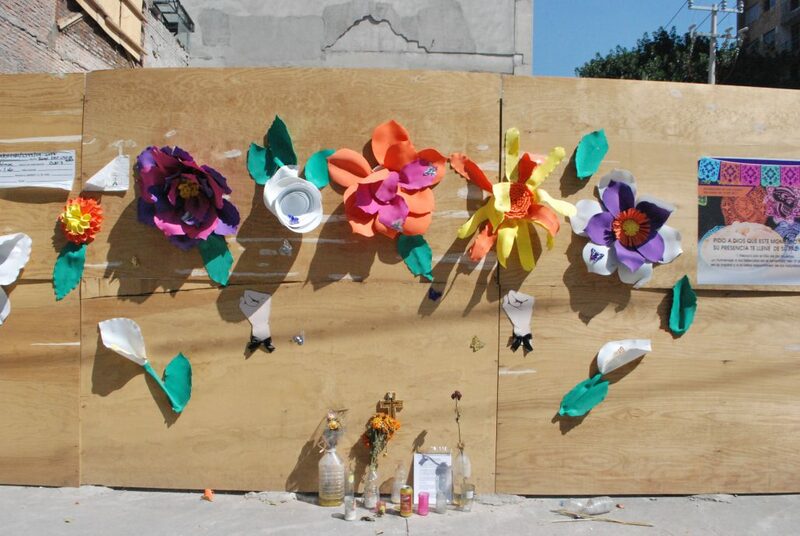 Flowers decorate the fence surrounding one of the fallen buildings in Roma Norte, in memoriam of the people who died inside. In the days after the earthquake, the city came to life with emergency response from professionals and citizens alike. Community parks around the neighborhoods of Roma and Condesa, where the brunt of the destruction occurred, were filled with medical professionals, including free therapy made available to local residents who were suffering from similar symptoms as Mich.
“The constant anxiety stayed with me for three weeks,” Mich remembers. Having flashbacks of the moment the quake happened, the avoidance of certain areas of the city, and the fear of recurrence are all common symptoms of PTSD, and all things Mich experienced in the weeks and months after September 19. Though she is feeling a bit better, there are still moments of worry: checking for cracks in the buildings she enters, walking on the other side of the street when she sees an abandoned building, being alert at any siren she might hear. Many others are still suffering post-earthquake stress and anxiety attacks. It is still the first thing that you hear people asking each other at the supermarket, “where were you during the earthquake?” or, “is your family and home ok?” For many, they are not. With up to 4,000 buildings damaged, many families have been displaced and the city will be dealing with structurally damaged buildings for months to come. 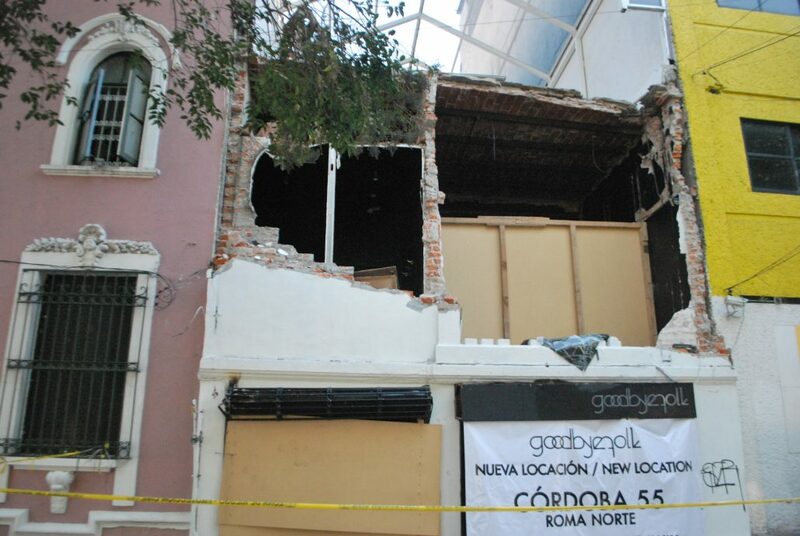 A popular clothing store in Roma Norte that was destroyed during the earthquake. Almost as an afterthought, Mich reflects on her work and how she was personally affected by the destruction. The school is in one of the neighborhoods that was most affected by the quake. And even though their building was unharmed, confirmed by officials checking building security post-earthquake, many are still deterred from being active in these neighborhoods and the local economy is slow to rebuild. The era of constant news and information creates difficulties in moving forward. And research shows us that survivors of natural disasters are much more likely to be affected by lifetime anxiety disorders. As Mich mentioned, hearing the news changed the type of fear she experienced. “There came a time when I had to disconnect. I wanted to keep listening to the news and I keep seeing what was happening, but I realized that it made me feel damaged.” Self-care for her, in a way, was formed through turning off the TV, the radio, and walking through her work neighborhoods, confronting the destruction by continuing her life and her work.